Shouldn’t Home Care Workers Earn a Living Wage? Massachusetts’s disability and senior care workers just got a major pay raise. Healthcare workers in Massachusetts got good news twice this past week. First, the Supreme Court upheld the Affordable Care Act and its insurance exchange rules—a system expected to add some 360,000 Massachusetts residents to the healthcare rolls. On Friday, about 35,000 workers who are providing disability and senior care through state programs got a major pay raise. Their new wage of $15 an hour puts Massachusetts personal-care assistants at the helm of the low-wage workers’ movement known as the Fight for 15. The wage agreement was brokered over several months of talks between the union and Governor Charlie Baker’s administration, for a contract covering one of the country’s largest unionized home care workforces. The raise in the hourly base pay, set to increase from the current $13.38 to $15 by 2018, will cover a majority of the state’s home care workforce, who provide an array of household services, such as daily social support and medical assistance, to seniors and people with disabilities, and now heads for a union ratification vote. According to a 2010 survey of Massachusetts home care workers, most are low-income women, many of them immigrants. Some entered the job caring for family members and others serve as attendants to people in their communities, as part of a broader effort to reorient senior and disability services away from institutions and toward local communities. 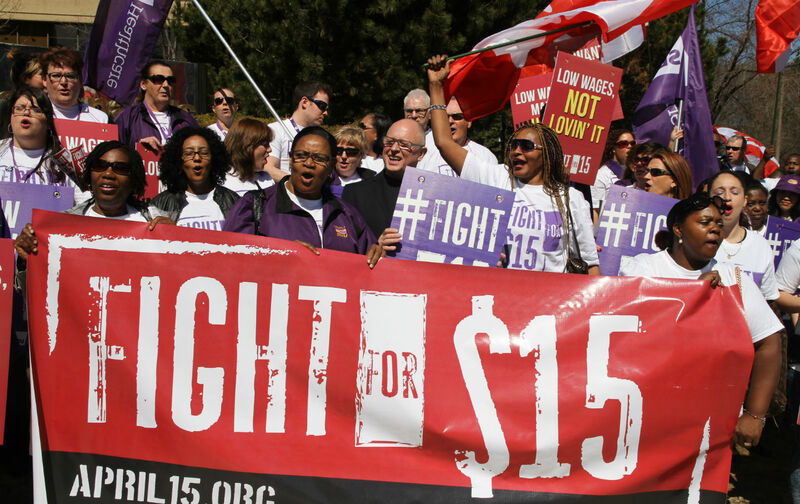 Their wage hike marks another notch of victory for the Fight for $15 movement, which in recent months has galvanized protests nationwide and helped push through local $15 minimum wage initiatives in Seattle, San Francisco, and Los Angeles. In addition to various city-level proposals, a $15 wage campaign is also underway in New York to raise compensation for the fast-food industry through a special wage board convened by the governor. For home care workers, the victory is especially sweet; it’s only in the past generation that the sector has transformed itself through a combination of state support and vital grassroots organizing. Yet nationally, home health aides remain exempt from even the federal minimum wage, reflecting major regulatory gaps produced by an historic bias against forms of labor performed by women and people of color, particularly marginalized women domestic workers. But state-level union campaigns in California, Illinois, and Massachusetts—along with a recent unionization vote in Minnesota, have led to massive unionization efforts, fostered in part by home care provider partnerships under state health plans. Unionization efforts continue to expand despite the Supreme Court’s ruling last year in Harris v. Quinn, which undermined the mandatory-fee mechanism that unions often rely on for organizational financing. Today, SEIU represents about 600,000 of the 2.1 million home care workers nationwide. In Massachusetts, while the new wage agreement is a step forward—and is coupled with other benefits like job training—the low-wage home care workforce still faces socioeconomic challenges. Reflecting national trends, surveyed personal care workers cited low compensation as a major problem that factored into some workers’ desire to leave the job: Roughly two-thirds expressed frustration about not being paid according to their time spent in the job. Other common complaints included a lack of paid sick leave and not being paid fairly according to skill level. Living wages help stabilize the workforce and improve the overall level of care. Research on San Francisco home care workers found that each added dollar on the base wage boosted workforce retention by 17 points, and retention rates jumped 39 percent to 74 percent “following significant wage and benefit increases.” Other research points to unionization itself as a boost to job and workforce quality. But the Massachusetts victory only underscores the plight of many other home care workers across the country, who remain exempt even from the federal base wage (dependent instead on state wage standards or just the whim of employers). The Obama administration recently moved to amend federal regulations to extend wage protections to home care workers, but the rule has been thwarted by litigation brought by the industry. In addition to supporting the ongoing expansion of public healthcare under the Affordable Care Act, the recent Supreme Court ruling affects home care workers more directly. While the consumer base grows for community-based services, many home care workers themselves may gain access to coverage, since a large portion of them earn poverty wages and are themselves uninsured. As workers campaign to extend the $15 wage floor to other sectors, it’s also spreading a vision of a care economy that treats both providers and consumers with dignity.